We open early and stay late for you. Midwest Engine Service is one of the few auto shops that offer loaner cars to their customers. 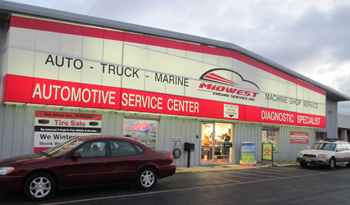 Midwest Engine Service is a full-service auto repair and preventive maintenance center. We have been performing our high quality and guaranteed auto repairs in the Madison area since 1989. We are conveniently located and qualified to repair and service all domestic and import cars, trucks, and SUVs. We only use parts that are equal to or exceed the standards of those parts originally used by the manufacturers. We are definitely the cost-effective alternative to car dealership servicing for all scheduled maintenance of your personal or company auto, pickup or truck. Regardless of where it was built, we will service your car or truck and still maintain the manufacturer's warranty. We believe in placing you, the customer, first. At Midwest Engine, we offer you unmarked loaner cars to use while we work on your car, because having your vehicle repaired shouldn't be an inconvenience for you - and you shouldn't have to act as our billboard. We also conduct a Courtesy Vehicle Inspection each time you bring your vehicle in to catch any unnoticed or potential problems with your car. What's more, all our work is guaranteed! Our auto repair technicians and machinists are ASE certified, with about 60 years collective experience. 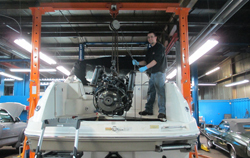 Midwest Engine Service is independently owned and operated. We pride ourselves on getting the services or repairs on your auto right the first time by our highly qualified service technicians. So drop your auto, SUV, or truck off today and allow us to provide you with excellent service. Call 608-244-9040 today or send us an email to schedule your maintenance or repair. We look forward to servicing your vehicle. I am from IL and was going to our home in Northern Wisconsin when I experienced car trouble. Lucky for me, I got off at the first Madison exit. I called Midwest Engine Service. They were AWESOME! They had me towed to their shop. Clean building and great staff. They got me back on the road within 3 hours. The repair bill was very reasonable. I would highly recommend this auto repair facility! I cannot begin to tell you how very much I appreciate the INCREDIBLE service I received from your staff ! I have been in the customer service business for over 30 years, I certainly have no problems recognizing EXCELLENT SERVICE and let me tell you your team GETS IT. From the helpful phone call to your shop when I was stranded at Home Depot to the tow truck driver calling to confirm to me that my truck was picked up...I will not ever take my truck anywhere else and you have a customer for life. I will tell everyone I know to do the same. Keep up the good work! To all of you -a BIG- thank you for all the time and effort you put into my car! I don't really know all the things you do but its much better now. The steering is better, the breaks feel better, and in general it just feels better to drive! Dear Wayne, Thank you for your note regarding my Audi TT alignment mishap and for being so noble as to stand behind the work done at Midwest Engine. I'm sure it is difficult at times, when trying to run a business well, to negotiate mishaps, both with customers and your staff, and I appreciate that your rose to the occasion and did the right thing by me, even as a cost to you. Thanks for the fast service and getting me in right away. You not only delivered what you said you were going to in the time you quoted, you went out of your way to fix two additional items for us, offered us a rental car and came in with a fair price. After (3) days of boating, Sat, Sun. & Mon. Eve, I'm certain you did not put the right engine back!! It is not the same. It is running far better than I could wish. Thanks for making my old boat new again. Just a big thank you for your excellent service, and for the times where I thought I was facing many $100's of dollars in repair costs that turned into only a fraction of cost because of your honesty. It's greatly appreciated to have an honest business that I can count on for my auto maintenance! Thank you! We want to thank you for the assistance you provided us on Saturday December 30th. We needed to get back to Michigan and even though you were closed you helped us out. We never would have made it home without you! Thank you. -Mike and Mary Beth K.
Thanks for all your hard work & effort you put into fixing my car. You went the extra mile to figure out what was exactly wrong, that's what makes you all special! The car runs great! Thanks again. Thank you for the great job you did on our vehicle and your customer service was outstanding! You quoted us a very fair price and then went above and beyond what was expected to make sure our vehicle was in great running condition. We also appreciated the loaner vehicle that kept us mobile while our vehicle was being worked on. We appreciate all the hard work you have done and we have highly recommend to you family and friends! Tom, Collin, and the rest of the crew at Midwest Engine. Thank you so much for the great service my wife and I received at your service center! Your were very courteous and the word done exceeded our expectations. P.S. - There is nothing better than to get the work needed done right the first time! To staff, thanks for fixing my Mazda van on December 30th and mailing my phone I left in your loaner car. It hasn't arrived yet but mail service in Canada is slow. I wish you all a great new year.